The Spring 2017 Issue theme is “Vintage Romance", a celebration of vintage films (preview highlights here). 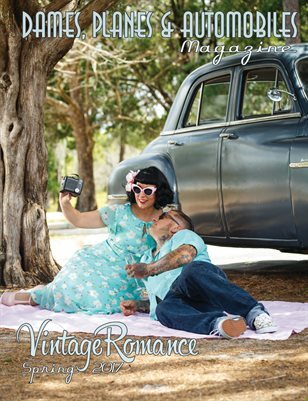 Featuring lovely dames, classic planes, curvy cars, and features on arts, culture, military history and veterans. Featuring Scarlette Saintclair, Jack Schulz, Sveinn Photography, Southern FlyGirl, Red and Ginger, Devyn Beth, Lucky Penny Photography, Miss O Kissed, Tim Hunter, Dynamite Dames, Shotgun Pinups, and more! As always, safe for work and family - friendly. A portion of our proceeds for each issue goes to veterans and active military! DPA Fall 2016 "Auld Lang Syne"